Unsere Weltkarte / Atlas ist eine politische Karte der Welt. Sie stellt die Länder in verschiedenen Farben dar und zeigt zusätzlich die größeren Städte aus der ganzen Welt. 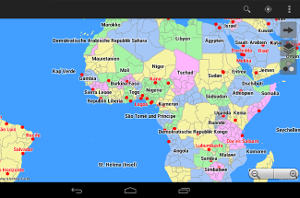 At the moment, there is not really any good World map / Atlas available for the Android platform. Google Maps may be fine for many things, but in my opinion it doesn't replace a good old paper atlas because it does not offer a beautiful political map. Most apps out there are either based on the Google Maps widgets and offer some functionality on top of that or they are basically a zoomable picture of some political map with very limited resolution. Now since I've been into developing vector-based map applications for a while anyway, I decided that I'd like to fill this gap by developing a really nice political world map as a mashup of several existing open data projects.